A client reached out to me wanting some help with her new downtown condo. She is a busy professional, with little time to meet, so we decided to treat her project like an e-design project. We did all of our communication through email and I provided her with a floor plan and furniture options that she could purchase on her own time. She wanted help with the main room of the condo. It is a long, narrow space with windows along one wall and open to the kitchen on the other side. Placing the sofa against the windows will maximize the space. It also allows for a nice open flow between the living area and the kitchen. If she wants extra seating, I suggested a small chair in the foyer area that could be brought over when needed. 1. The Davis Queen sleeper sofa from Crate & Barrel is a great piece to anchor the space. I like this couch for its clean lines and nice shape. (I like it so much that Andrew and I have this couch with a chaise in our living room!) The arms are narrow, so it is a good fit for a smaller space. It comes in a variety of colors, but I like the color here: Mink. She does not have a guest room, so the sleeper sofa will allow her to hosts guests in her new home. 2. This adorable tufted chair is an updated version to a traditional parlor style chair. The tufted back and swooped arms give it a feminine touch without being overly girly. The chair comes in a variety of colors, and picking something fun, like Grape, gives the space personality. 4. A round side table helps to break up the shapes in the condo. I loved the texture and size of this table. 5. A media console with reclaimed wood and ebony stained surround is the perfect fit for a chic downtown condo. Pops of color in pillows and accessories will give her condo personality and make it feel like home. I love to mix and match patterns and textures in pillows, and these four will coordinate beautifully with the purple chair. 6. The multicolor floral pillow is a great one to start with on the sofa. Aside from the purple, it also brings in three other vibrant colors in the red, orange, and green. 7. The chenille diamond pillow is perfect for adding texture to the room. It also gives a nod to the pattern on the side table. 8. 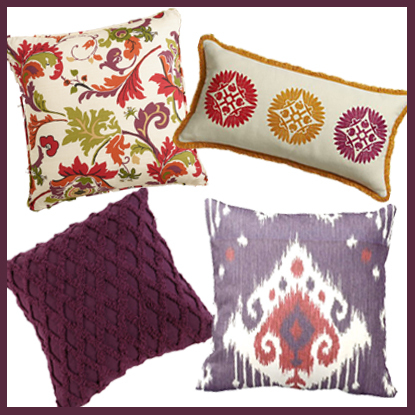 Ikat is a classic Indian design, but the purple and red color scheme of this pillow give it an updated feel. 9. Colorful medallions and playful fringe make this lumbar pillow the perfect finishing touch to the room. I enjoyed putting together these ideas to help her create the perfect feel for her new home! ° Which piece is your favorite?